I started writing this blog entry a few days ago. Originally, I planned to share with you a funny thing that Ethan had said. But before I posted it here I decided to send it to my cousin Michael Todd in Iraq. He's a Major in the US Air Force. He was deployed to Iraq in January and will be coming home in a couple months. I thought you might enjoy these two different thoughts on heroes. Both are worth reading. what you do in service of our country. "no Daddy, I'm going to be Batman." could use Batman's help over here. I definitely appreciate the prayers...keep them coming. Operators helping us clear and level some land here on Sather Air Base. left at lunch to go to the stress clinic since he had problems at home. "hero" for me. He died trying to save others. with our 6 month deployment. It is really starting to get hot here now. Friday, May 13th 1994, I went on a date with a girl from Jasper, Alabama. 15 years later we're still together. Although the anniversary of our wedding now trumps this date on our list of dates to remember, I can't help but think back to that date as the day it all began. I don't think Kristi is even aware of the significance of today's date. But I think she'll figure it out when she receives the dozen roses I'm having delivered to her school today. Kristi, Thanks for 15 great years. Ethan and Gavin earn quarters around the house for helping clean up from time to time. Last week Ethan had saved up some of his money and had earned a little extra for listening to the coach and playing well in his little league game, so we decided to take a trip to his favorite place, Wal-mart's toy section. For 15 minutes he scanned the rows and rows of toys and finally chose a new Star Wars "Galactic Heroes" set to go with the small army of them that he's already collected. He showed me which set he wanted. Before I looked at it, I knew it would be a Jedi or maybe a Storm Trooper with a big gun. He usually chooses his action figures by who has the best weapons. Nope. Here's the set he chose. He says he picked it because this R2D2 (with drink serving tray) will fit in his x-wing fighter. But somehow I doubt that's totally true. I saw "Return of the Jedi" when I was 10. I liked the "Slave Leia" scene too, but it wasn't because of R2D2. Still, I think my response is "Ethan, You have chosen... wisely." This past Saturday was one of those day I'll always remember. Lots of great memories created that day. It's rained for most of Ethan's first game, but the coaches decided to go ahead and play anyway so we wouldn't have to schedule a makeup game. The boys playing loved it. They all got real muddy and had fun getting to slide around in the mud. Ethan especially loved it because he saw an improvement in his hitting. Both Ethan and cousin Will had a blast. 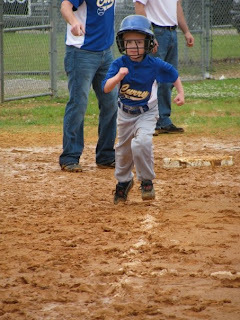 Here is a pic of Ethan heading from 3rd to home plate. Gavin & cousin Nichols, they had a whole different kind of fun. 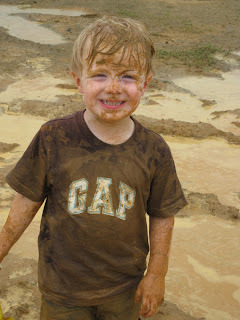 Nicholas quickly discovered that rain + dirt = mud holes. It didn't take too long for Nicholas to convince Gavin to join in the mud stomping fun. Rather than try to convince them to stay out of the mud, we decided to just let them go for it. It was a lot of fun, but still, I hope it doesn't rain again this Saturday.